1984 was the 2nd year for the Predator modified by Tom Soloman and sold by specific dealers they featured a Cobra air cleaner, Monte Carlo bar, roll cage, wood shifter knob, Shelby 8 spoke wheels with spinners, SVO suspension, hood scoop, hood pins, G.T.302 or G.T.302 R graphics, and more. The Predator Cobra version was also available. They had the Cobra package and Cobra on the valve covers. 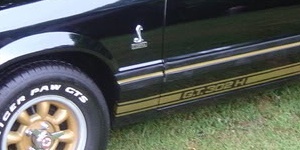 Around 130 cars were modified in 1984. More information can be found at graphic-express.com. Check this one out! It's an Oxford White 1984 Mustang Predator. Serial number 4S0102. It's owned by Steve and is our featured Attitude Of The Week for the week starting October 3, 2016. Steve says, " Bought this out of Gardner Kansas as a complete restoration. Currently a show car queen." Tom Soloman created these and they were sold at Ford dealers from 1983 through 1986. Some of the unique features included; Cobra air cleaner, Monte Carlo bar, roll cage, wood shifter knob, Shelby 8 spoke wheels with spinners, SVO suspension, hood scoop, hood pins, and GT302 or GT302R graphics.